We’ve watched it coming from a mile away, with one reality show after another eclipsing good ol’ fashioned music videos, but now it’s official: MTV is no longer music television. The new logo is cropped and scaled to fit today’s 16:9 aspect ratio TVs versus the old 4:3 standard, and it plays on the old logo’s adaptability to promote the network’s new favorite breed of programming. Perhaps most notably, the “Music Television” tag is gone. 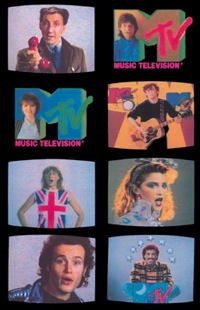 That Stones-branded logo accompanied the infamous 1983 commercial campaign featuring Mick Jagger shouting “I want my MTV!” that got thousands of kids to pester their cable operators to carry the channel. Pretty soon, Lois said, stars like David Bowie, Stevie Nicks, and Boy George were recording their own versions–with their own matching logos. The living logo only ran for a few years though, and until this new re-design, “I don’t think they took advantage of the fun you could have with that logo,” Lois said.